This error is appearing because our checkout is attempting to verify the payment but cannot, and payment is being declined. In most cases, the reason for the decline is because the billing address does not match the address on the credit card statement. Your card is being declined. 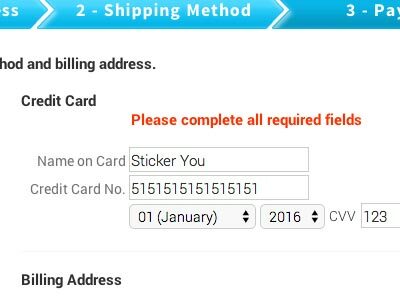 Our checkout has verified that the card information is correct, but payment cannot be completed. This could be for any number of reasons. In this case, we suggest contacting your credit card company for a resolution, as we do not receive any detailed error reports. Ensure all fields match the credit card statement. If you already have a PayPal account linked to the credit card you are attempting to pay with, you must log-in. (Although sometimes you can still pay as a guest, the easiest fix is to log-in and pay). My order didn't process, but my card was charged! Our validation process checks first to see if you have the funds. Then it checks to make sure your billing address is correct. If it is, then your payment goes through correctly. If not, the authorization hold remains for the amount we were trying to take, but the payment is declined and StickerYou will never receive the funds. These funds will automatically be returned to you in 5-10 business days depending on your bank’s policy. Sometimes the payment is being declined even when all of these fields have been filled out correctly. We are trying to resolve this with our payment processer, but if you still can't check out please fill out our contact form and we will be happy to process your payment over the phone.